We want all children in Devon to have the best start in life, growing up in loving and supportive families, and being happy, healthy and safe. This means access to high quality universal services such as health care and education; early intervention when needed, and targeted support for children and families who are in difficulties. We want to prevent children and young people from developing emotional problems and having to live in poverty, or where they or their families are affected by abuse, violence or misuse of substances, so that we prevent problems being passed from generation to generation. Excess weight in children at reception remains similar to the national average but at year 6 is better. Teenage conception rates continue to fall. There will be greater understanding of the needs of local children with a physical disability. Looked after children: What makes you happy? In October 2015, Children in Care in Devon were surveyed and asked about their views on their health and well-being, as part of a wider Health Needs Assessment in support of the JSNA. 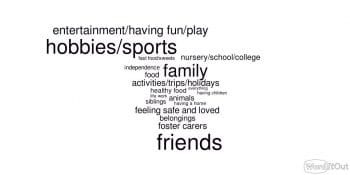 Independent of age group, all children and young people placed a high value on ‘family’, ‘friends’ and ‘hobbies & sports’ to support their happiness. Older participants (16 and over) also focused on being ‘safe and loved’ and ‘entertainment, having fun and play’. 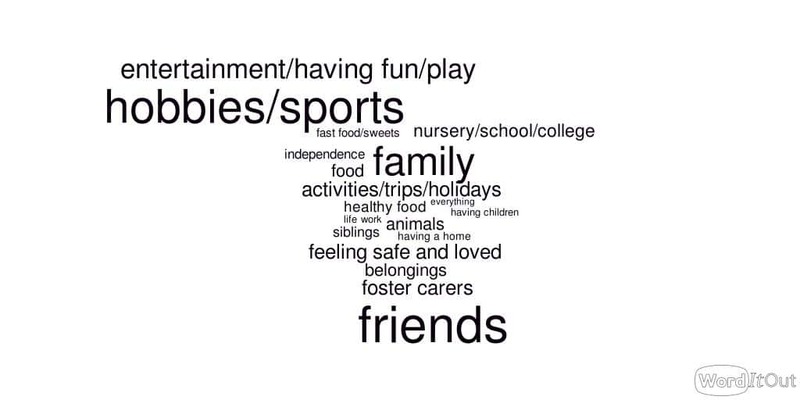 The word cloud shows the responses to the question – with the most popular represented by larger size words.